WEST TOWN — Saying, "If you can't beat 'em, eat 'em," seventh- and eighth-graders from Catherine Cook School in Old Town explored whether it was possible to deal with the invasive species of Asian carp Tuesday by eating the fish. Some 15 middle-school students made a field trip to Local Foods, 1441 W. Willow St., where chef Thomas Leonard had a carp and two recipes ready. Cook, 226 W. Schiller St., is a high-achievement private school with an enrollment of just under 600 students and a student-teacher ratio of less than 10-1. It also emphasizes "global citizenship," as well as technology. The field trip grew out of an idea from students learning about invasive species as part of studies with the Global Issues Network. They borrowed something some of the students learned last year on a class trip to Colombia and Cartagena. If those societies had learned to deal with the invasive species of lionfish in part by eating them, why not bring the same idea home to deal with Asian carp? Handcut Foods had to go to Niles to find a fishmonger that carried Asian carp. "We wanted to see if we could make it happen more in Chicago locally," teacher Emily Malette said. Quizzed about the fish, students knew right off it was an "invasive species," spreading through the Midwest and causing problems for other fish native to the region. "They're spreading so rapidly, and no one is eating it," said Leonard, who supplied the expertise on cooking the fish, which actually had to be brought in from a suburban Niles fishmonger because no Chicago suppliers carried it. "This is one of the boniest fish I've ever worked with," Leonard said. As he first literally topped and tailed the fish, then cut out the spine, and as the knife audibly clipped the back bones, a couple of the students uttered an audible, "Oh!" Otherwise, however, the students were game for the less-than-gamefish and helped prepare the small filets Leonard cut up either with a blackened spice rub or in a corn-meal batter. "You really can't mess this up," Leonard said. "If you can't beat 'em, eat 'em," said George Madzhirev, chief executive officer of Handcut Foods, the preparation arm of the Local Foods store specializing in local Midwest fare. Some students, wearing "Team Carp" T-shirts, had the same motto written on the back. 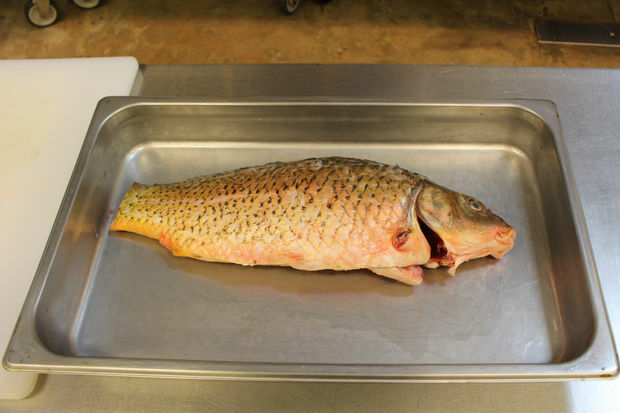 "The fish is actually pretty beautiful," said Andrew Osterman of Handcut Foods. "It has a bad reputation." Leonard said it was a little more of a problem than that, insisting it was "a rather bland fish in general" and "so difficult to work with," meaning it's not likely to turn up on the menu of any Chicago restaurant — even one devoted to sustainable, locally sourced fish — any time soon. Where a good meaty fish might deliver 70 percent of its weight in edible chunks, Leonard said, the Asian carp was more about 25 percent edible, with the rest relegated to making fish stock. It did come bargain priced at $2.99 a pound, he added. Even so, the kids dealt capably with preparing the fish, and settled down with it after Leonard grilled the blackened fish and deep-fried the battered fish. 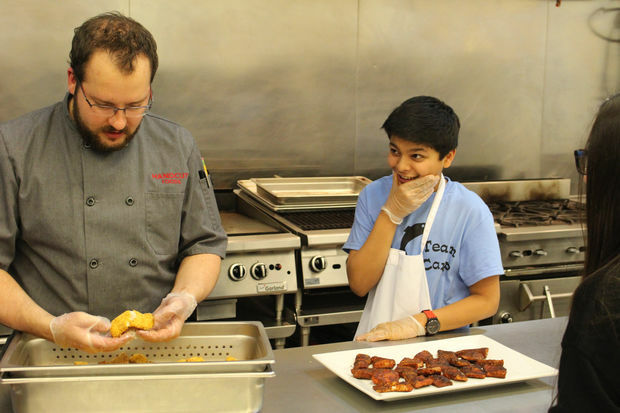 "It sounds so good," said one student as the battered fish sizzled in the deep fryer. The dishes were augmented with a red-pepper aioli and caramelized onions, to sweeten and flavor the fish, with rice with peas and broccoli and garlic on the side to "impart a lot of flavor to a fish that doesn't have it," Leonard said. "This is so good," said one student, and there wasn't so much as a grimace at a bite at any point, as many went back for seconds. Leonard expected the fried fish to be "more of a crowd pleaser," and prepared more of it, but the blackened fish actually went first, and only a few morsels of the breaded fish were left at the end. "I'd eat it," teacher Lara Kossiakoff said.